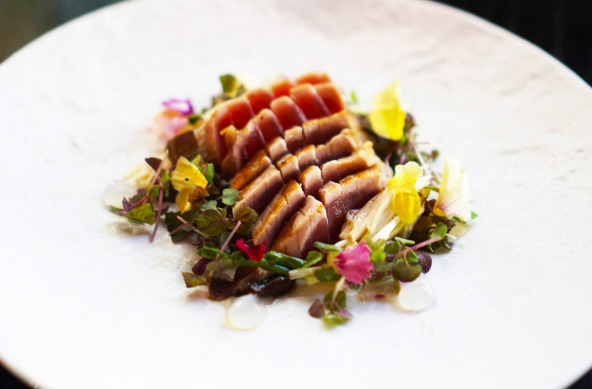 Chase Kojima, the head chef of the popular Sokyo at The Star has stated many times that he aims to make it the number one Japanese restaurant in Sydney. 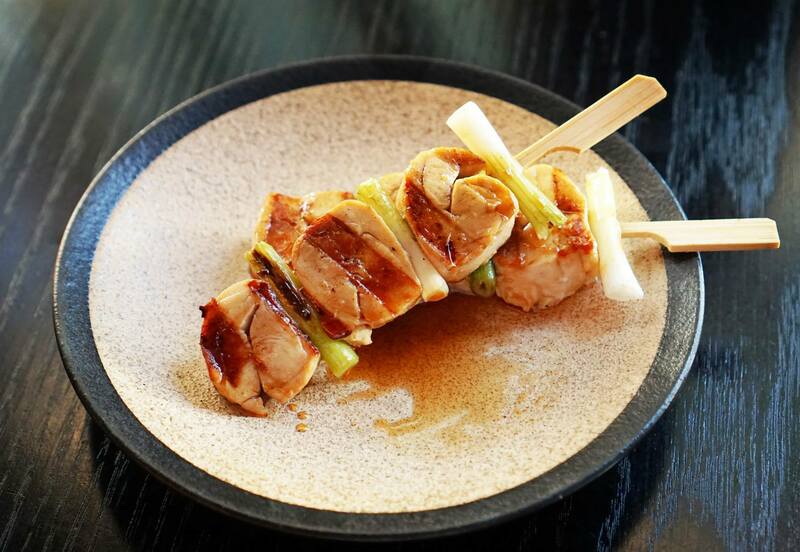 Judging by the dinner we had just last Friday the restaurant is definitely one of the best we’ve been to and has again raised the bar for good Japanese in Sydney. 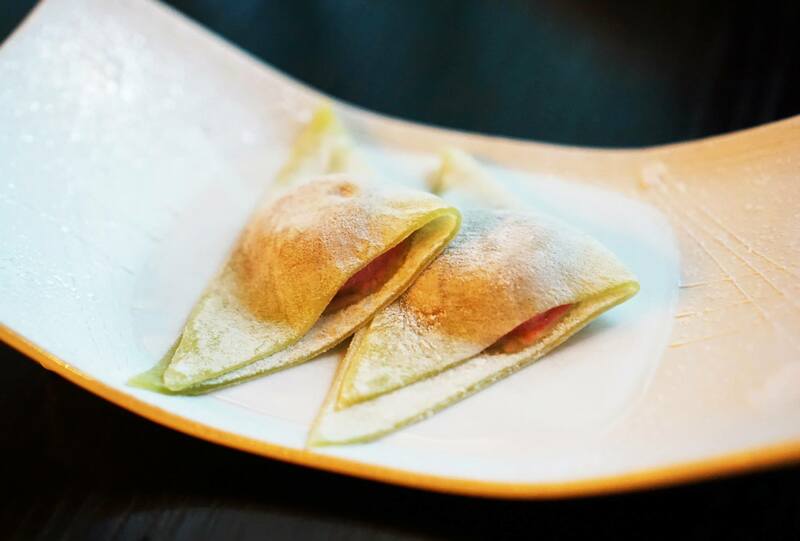 The menu at Sokyo is designed to be served in a specific order similar to a multi-course meal. The first section was all sashimi making it the most difficult decision, alas we had to pick one and finally decided on the tuna. The beautifully presented dish features very fresh tuna and a really nice and zesty leek aioli to tie the garnish together. The most interesting garnish were the small droplets of rich clear gel. I was told be a colleague at work that the tempura at Sokyo was one of the best simply because of how light it is whilst remaining flavoursome and crispy. 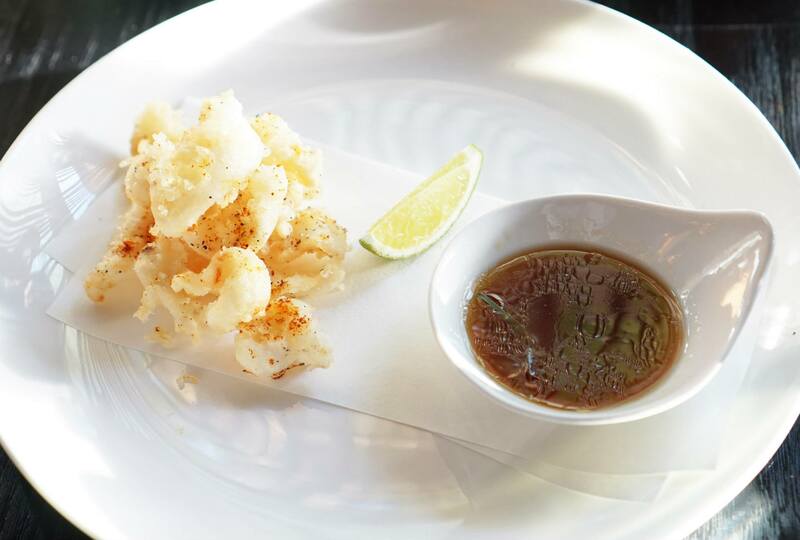 The cuttlefish was a perfect example of this as it melted with each crispy bite yet retained all the flavour, as a huge fan of ponzu sauce this dish was pretty much perfect. I’ll admit, when I saw the words truffle, lime and mushroom in one sentence this dish was immediately in my sights. 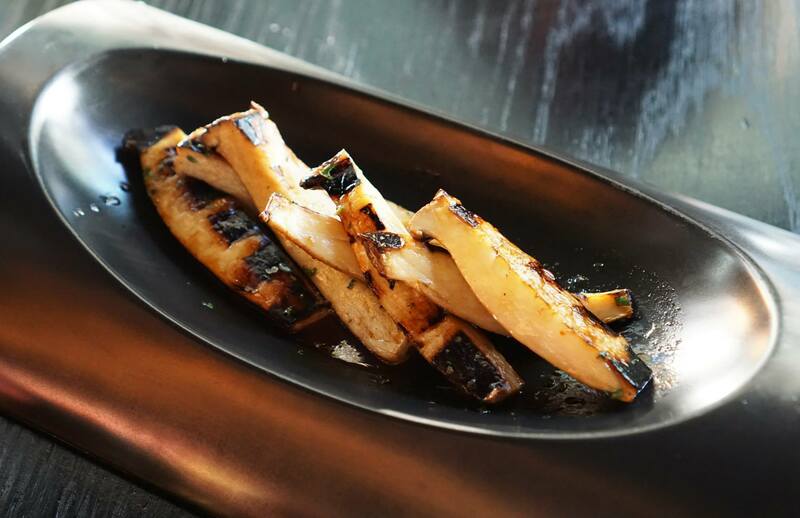 The flavour of the mushrooms and the sauce was perfect but I have to say the mushroom itself was a bit frustrating to eat as the tough outer skin makes it impossible to eat it in small pieces without a knife. A relatively average dish of grilled chicken, the sauce and leeks were really nice and the chicken was definitely tender and better than the average but it’s often hard for a simple grilled chicken dish to ‘wow’ me. This was the only proper ‘main’ that we ordered and I feel like I definitely made a good decision. 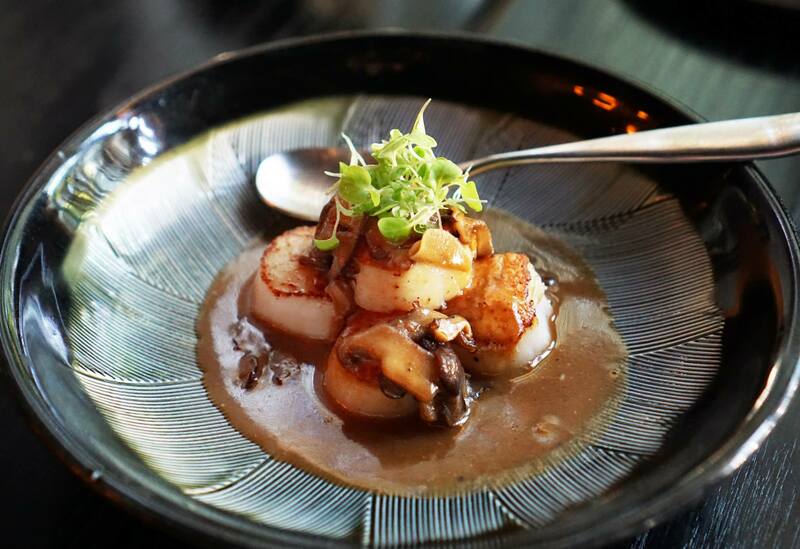 The scallops were succulent and soft but the sauce is what made this dish so mouth watering. I originally thought the wasabi would be overpowering but it turned out to be extremely subdued and you can only just taste it as a base, the sauce is more like a creamy mushroom and pepper sauce with hints of Japanese ingredients. As huge fans of aburi salmon we felt that we had to give this one a go and see how it compared to regular sushi joints. The salmon belly was easily the most rich and tender grilled salmon we’ve had. 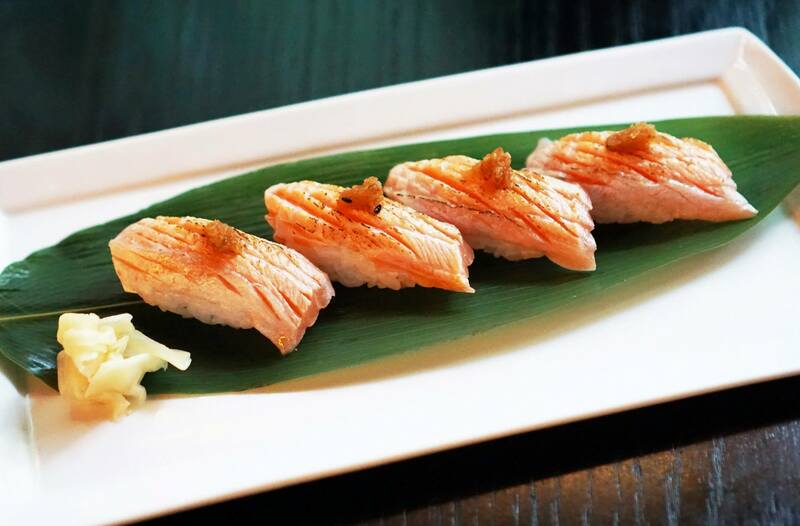 This particular aburi salmon didn’t have any mayo and is instead replaced with tangy daikon oroshi. 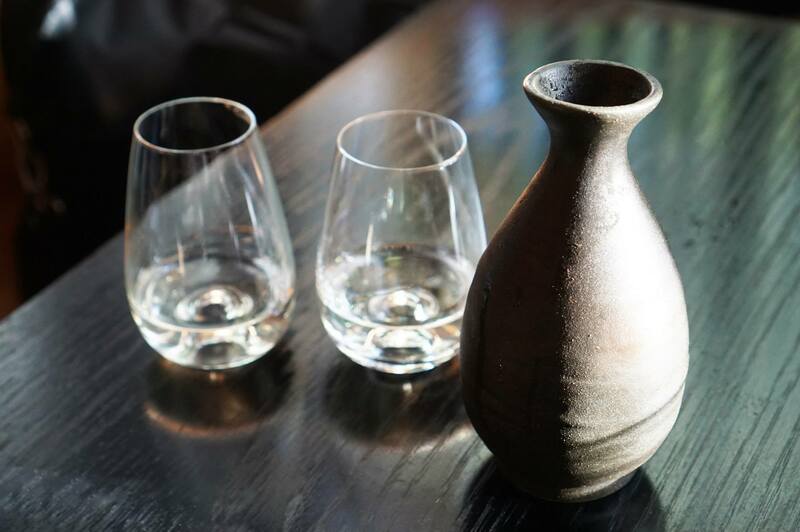 I’ve discovered that I really enjoy sake more than wine and have now started ordering it any time I see it on the menu, this particular carafe was really affordable ($21) and had a nice strong fruity taste. I’ve been to Japan three times and each time I eat and buy loads of yatsuhasi which are these little mochi treats found in Kyoto, this is the first time I’ve seen it in Australia. This particular variation uses a really sweet ice cream which makes it a nice tasting chilled dessert that I could easily eat loads more of. 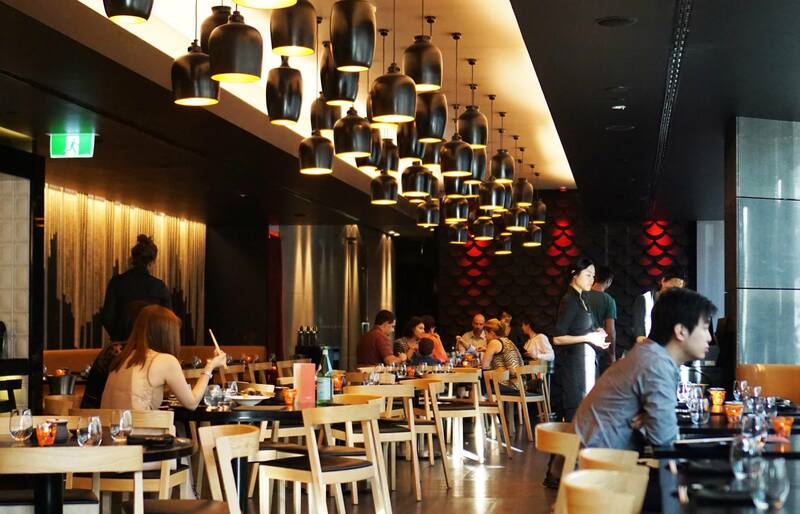 Overall I would rate Sokyo as one of the best if not the best Japanese restaurant we’ve been to in Sydney. Miss K still thinks that Sake Restaurant is better but I feel the food here is more refined, unfortunately the quality does come with a relatively hefty price tag as our meal ended up costing $150 for two. I want to try this place so badly because I love sushi so much! The tuna looks gorgeous 🙂 Still need to try Sokyo.. It certainly doesn’t seem like a cheap meal, but the look of a few of the dishes makes it seem almost worthwhile? Those scallops in particular look divine! This is my favourite japanese joint in sydney. The quality and consistency is worth the price tag! I got stuck at the tempura cuttlefish! light, crispy and melting, oh wow! I love Japanese food so I’ve been wanting to go to Sokyo for ages, especially if it’s aiming to be the best Japanese restaurant in Sydney! Love the sushi at Sokyo! It’s not cheap, but worth splurging for the quality!